Catalog > Vogue Ginny "Pink Buds"
This sweet Vogue "Pink Buds" Ginny is a 2004 Vintage Reproduction 8" doll designed after the original 1957 Ginny #7036. She has pretty long auburn hair with bangs, brown sleep-eyes, and painted lashes. She is wearing a darling pink floral and white print pinafore dress with a lacy white over skirt that is open in the front, a matching bonnet lined with white on inside and lace and pastel flower edging, white socks, and white center-snap shoes. and a signature "Ginny" pink purse. 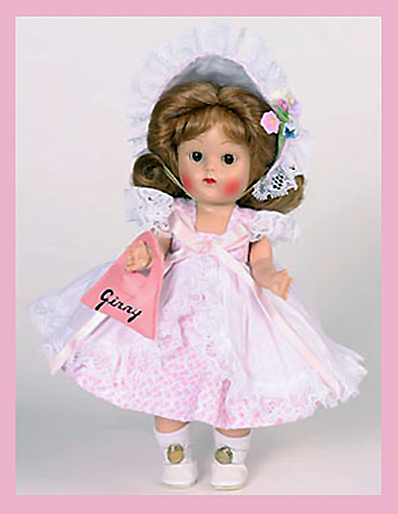 A sweet doll resembling the original Ginny dolls that captured our hearts in the 1950s! Limited edition of 1,000. Pink Buds reproduction Ginny will come to you in MINT condition, in her original box, with signature silver hand-tag, certificate, and doll-sized comb and brush.